Foix–Chavany–Marie syndrome (FCMS) is an extremely rare suprabulbar palsy. It is also known as facio-labio-pharyngo-glosso-laryngo-brachial paralysis or the cortical type of pseudobulbar paralysis. FCMS was first described by Foix in 1926. We report a 33-year-old male patient presenting with acute onset of aphonia and facio-labio-glosso-pharyngo-laryngeal paralysis with preservation of involuntary and emotional activities. The patient, who was followed up for 7 years, was a 33-year-old right-handed male, who presented with acute onset of voice loss, inability to swallow and speak, inability to move tongue, and difficulty in chewing food. He had no personal or family history of systemic illnesses, smoking, or connective tissue, cardiac or cerebrovascular disease. His general physical examination revealed a weight of 82 kg and normal vital signs, with a blood pressure of 125/66 mmHg. In the neurological assessment, he was aphonic, but his verbal and reading abilities were normal. He was able to answer questions by using signs and by writing. The pupillary, corneal and blink reflexes along with extraocular movements were normal. He was not able to open his mouth, protrude his tongue, show his teeth, whistle, chew and swallow. The tongue was in the midline position and immobile. No tongue atrophy, fibrillation, or deviation was observed. The taste sensation was unremarkable. Spontaneous smiling and yawning were preserved. There was bilateral palatal palsy with an abolished palatal reflex. He had weakness (3/5) of the extremities on the left side, and Babinski's sign was present. His deep tendon reflexes were normal. Examination of the extrapyramidal system, coordination, and sensory system did not reveal any abnormality. He had no limb apraxia. 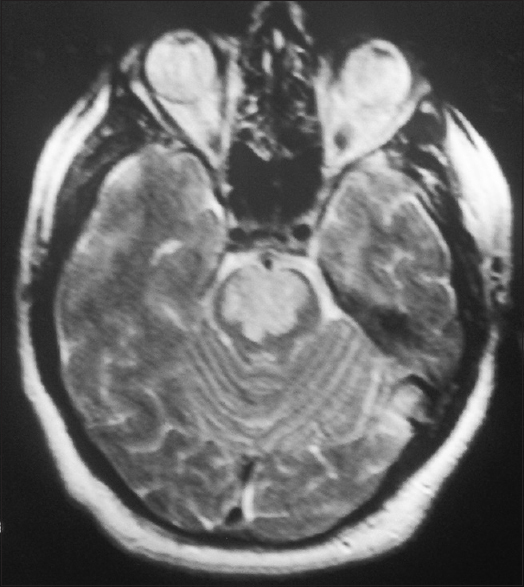 The patient's cranial magnetic resonance imaging (MRI) was done and on T2-weighted sequence, a hyperintense acute infarcted area was seen at the center of pons [Figure 1]. This lesion did not show enhancement after the administration of a contrast agent. His hematologic, biochemical, and advanced cardiac examinations were found to be normal. Doppler ultrasonography of the carotid-vertebral artery revealed that the distal part of the right vertebral and basilar artery were found to narrower than usual. The patient was considered to be having a large artery intracranial disease. The patient had a very slight improvement after an intense speech therapy. He was subsequently placed on nasogastric feeding and discharged. The neurologic examination at the end of patient's 7-year follow-up was unremarkable apart from the persisting mild hemiparesis as well as increased deep tendon reflexes on the left side, and moderate dysarthria. On follow up cranial MRI, a chronic infarcted area at the center of pons [Figure 2] was observed; and, on cranial MRI angiography, an occlusion of the right vertebral artery and basilar artery was also observed [Figure 3]. FCMS often develops after ischemic strokes. The hallmarks of FCMS are anarthria and the loss of voluntary control of the facio-pharyngeo-glosso-masticatory muscles, with preserved automatic and involuntary emotional reflexes. The reported cases of acute FCMS in the literature include bilateral, or rarely unilateral, opercular infarcts; infarcts in the left operculum and right/bilateral corona radiata; infarcts in the bilateral corona radiata; or, acute bi-opercular and chronic unilateral pontine infarcts. To our knowledge, FCMS secondary to isolated pontine infarcts has not been reported. 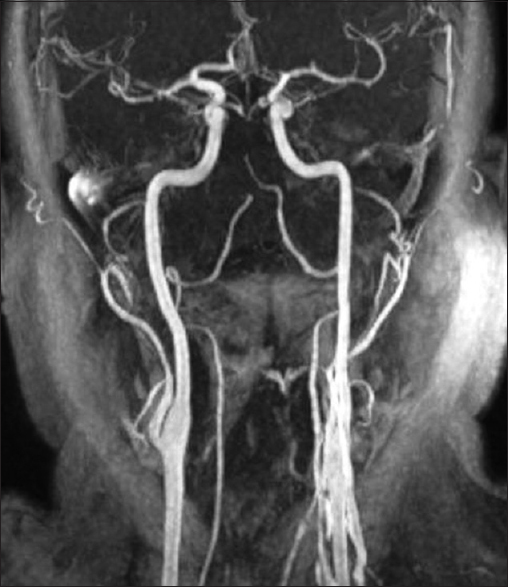 In this report, we highlight that FCMS can also be caused by pontine infarct, and that the pontine lesion resulted in pseudobulbar palsy causing anarthria, dysphagia, and a discrepancy between voluntary and automatic facial muscle movements. Further studies are needed to clarify the mechanism behind the FCMS. When encountering stroke survivors with FCMS, we should keep in mind that this unique syndrome is not only associated with opercular lesions. Therefore, a detailed radiologic examination is mandatory in order to delineate its neuroanatomical basis. Ohtomo R, Iwata A, Tsuji S. Unilateral opercular infarction presenting with Foix-Chavany-Marie Syndrome. J Stroke Cerebrovasc Dis 2014;23:179-81. 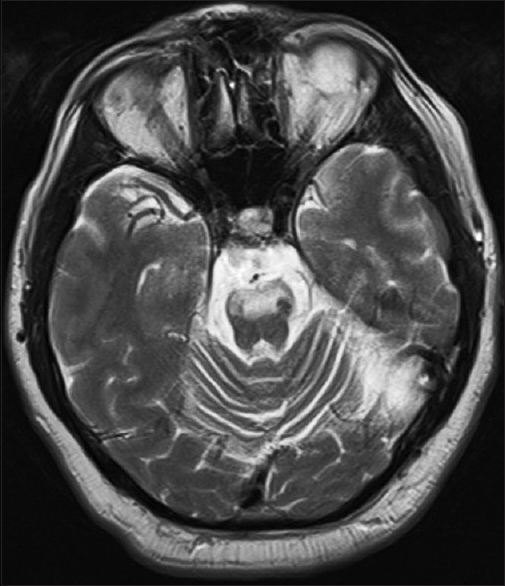 Kobayashi S, Kunimoto M, Takeda K. A case of Foix-Chavany-Marie syndrome and crossed aphasia after right corona radiata infarction with history of left hemispheric infarction. Rinsho Shinkeigaku 1998;38:910-4. Bradley N, Hannon N, Lebus C, O'Brien E, Khadjooi K. Bilateral corona radiata infarcts: A new topographic location of Foix-Chavany-Marie syndrome. Int J Stroke 2014;9:E39. Ghika J, Vingerhoets F, Bogousslavsky J. Dissociated preservation of automatic-voluntary jaw movements in a patient with biopercular and unilateral pontine infarcts. Eur Neurol 2003;50:185-8.